The Indalo is made in Dekton Keranium, for which 30m2 has been used. The new roundabout by Mojácar’s Parque Comercial, with its three waterfalls, is already fully operational after its recent remodelling. The work is nearly completed with only the name of “Mojácar” still to be added. Uniquely made in Dekton, it is an original design by the Municipal Technical Architect, Rodrigo Simón. Its new conception features three flowing sheets of water in the form of a waterfall, an area of foliage covered with blue flowers imitating the Mediterranean and an Indalo at the very top, also made from Dekton. Dekton is a revolutionary product and leader in architectural coatings worldwide and, has been gifted to Mojácar by its inventor, Francisco Cosentino. For the new roundabout’s construction, three types of this new product have been employed. The Indalo is made in Dekton Keranium, for which 30m2 has been used. The surface of the island required 250 m2 of Dekton Trilium and Keranium, whilst the white waterfalls used 50m2 of Dekton Zenit. This material, which has received many international awards and is used by the best architects worldwide, is the result of the research and development of the Cosentino Group, one of the most important companies in Europe. Since its inception in 2014, Dekton has revolutionized the world of construction and despite being on the market only for a short while, has been used many times and, in some of the finest buildings. However, it is the first time that it has been chosen for the embellishment of a roundabout and, for the construction of a sculpture like the Indalo. 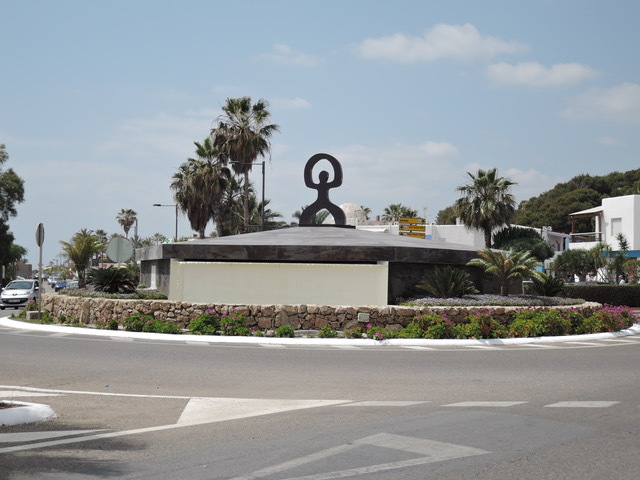 The decision to renew the Parque Comercial roundabout was taken due to the continuous repairs of the old fountain’s motors, which were costly and had a low operating life and therefore, was a great expense to the town. The new roundabout, an indicator of urban architecture, has given the area a modern look that is much more appropriate to the municipality.